Originally released in January of this year, the début album from this German trio is very much worth travelling back to experience, not least for that rather fantastic artwork depicting a tentacle-faced being emerging from an underwater tomb. 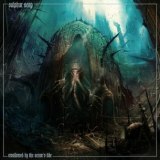 As you'd expect, the album's theme is Lovecraftian, and the music matches it with a very heavy and layered yet not unmelodic death metal sound, something like Vader meets Hypocrisy with a shot of Incantation, and a murky production that makes the music sound like it was recorded deep underwater. It's quite overwhelming on initial listens, stupendously heavy and hindered in clarity slightly due to that production, but a little familiarity works wonders, and it doesn't take long for Swallowed by the Ocean's Tide to sweep you away with its sheer quality. Intro Cthulhu Rites is an early marker of this, all crushing waves and wild, ritualistic yells of 'ia! Ia! Cthulhu Fhtagn! ', before first track proper Incantation swarms in with crushing Swedish-style death riffs, soon leading into blasts and screams galore. From drummer D to vocalist M, the band are highly skilled, M especially worth praising for his deep growls and screams that roll out over the turmoil perfectly. It's like a heavier, more atmospheric Amon Amarth, lyrics such as 'hear me, oh titan of the sea/great Cthulhu, dreamer in the deep' perfectly suited and declaimed well enough by M to be understandable. And, of course, it's absolutely epic, little touches like the drum-roll intro to Inexorable Spirits adding to the perfect guitar tone, melodic leads, and general grandiose style to make for a gripping listen for death metal fans. Crushing cuts like The Devil's Gorge are absolute torrents of death metal quality, neither old-school nor modern but an otherworldly freshness that Sulphur Aeon deserve a lot of praise for tapping into. And they haven't mixed in other genres to do it; From the Stars to the Sea and Those Who Dwell in Stellar Void mix a little doom in, but otherwise this is about as pure as death metal gets. I think the band can do even better, though. There's not a vast deal of difference between tracks, and I wouldn't recommend this to a death metal newcomer for the sheer aural weight alone – even experienced ears may find things a little too samey, especially in the album's second half. Worth noting that the bass is almost completely inaudible, too; there's no denying that the production works for the music, but a clearer production wouldn't detract from the skill of the compositions at all. So there's probably even better to look forward to, but don't let that detract from your enjoyment of Swallowed by the Ocean's Tide, because this is an excellent début. It may not destroy the mould altogether, but as far as death metal goes this is a bracing slap in the face, made by people who clearly understand the genre and are superb at combining good songs with atmosphere heft. Much heavier than plain melodeath, but far from the uniform bluntness of 'core-influenced death metal, Sulphur Aeon deserve your ears. Finale Zombi (a death metalled-up cover of the horror film theme originally composed by Fabio Frizzi) is the icing on the cake, but in itself is a signifier of good taste (as my colleague Charles would doubtless agree!). A cut above the rabble.